Bite-Sized: Familiar | Wake up, Meeples! Most junking attacks in Dominion are terminal actions, which makes it difficult to hand out more than one piece of junk in a turn. Familiar breaks this rule, meaning that whenever you see it, you have to account for the possibility that this could happen to you. Even though it’s expensive because of its Potion cost, Familiar is powerful enough that it often demands an opening of Potion along with another card that maximizes your chances of hitting $3P on either turn 3 or 4, and has an effect powerful enough to justify the tempo loss you’ll probably sustain on all other fronts for doing so. Familiar is strong, but not so strong that it can never be ignored. 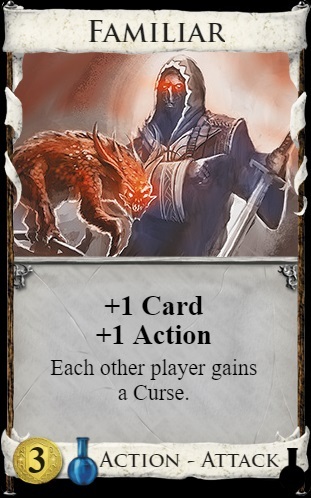 A decent benchmark for ignoring Familiar would be that you have complete control over your deck (you are overdrawing it) by the time Curses start coming in more than once per turn.